Pictured is the Vibe Bar nightspot, on Holywell Street, Chesterfield. 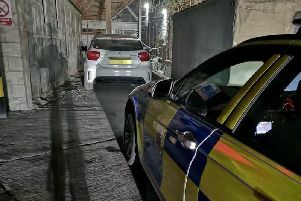 A booze-fuelled reveller has been fined after he ran amok outside a Chesterfield nightclub while wielding a piece of wood. Chesterfield magistrates’ court heard on November 14 how Thomas George Savage, 28, had been thrown out of the Vibe nightspot, on Holywell Street, after he was spotted behaving aggressively to others. Prosecuting solicitor Neil Hollett said: “Police first saw him outside at 5am and he said he had been hit around the head with a section of wood but there were conflicting accounts. “Police attended the pub and got CCTV footage and the defendant was seen on the footage drinking inside the public house or nightclub and he was in the outdoor area becoming aggressive to other males. Mr Hollett added that Savage swung the wood around and it struck a female who was left clutching her head before he also swung the timber towards the venue and threw a barrier at the nightspot. CCTV footage also showed the offender being angry and aggressive to club staff during the incident and he appeared to throw a bottle prior to the incident with the wood. Mr Hollett said it is believed a staff member was also forced to hit Savage with a piece of wood in self defence after Savage had been coming towards him. Savage, of Periwood Drive, Woodseats, Sheffield, pleaded guilty to affray after the incident on July 6. Defence solicitor Sharon Bradford said Savage had been in Chesterfield with his partner and friends and accepted that he had consumed a lot of alcohol and that his behaviour was out of order. Ms Bradford added that an argument had broken out involving his friend and he cannot remember what had happened but he recalled being struck to the back of his head and being taken to the ground. Savage is autistic, has Asperger’s syndrome and Tourette’s syndrome, according to Ms Bradford, and he can overreact to situations and had recently suffered a family bereavement. Ms Bradford added that the female who had been struck by a piece of wood during the incident was Savage’s partner and she did not suffer any injury. Magistrates sentenced Savage to a nine month community order with a Rehabilitation Activity Requirement. He was also fined £175 and must pay £85 costs and an £85 victim surcharge. Magistrates also banned Savage from going to the Vibe nightspot for nine months.